Rainfall over eastern Africa (10°S–10°N; 35°E–50°E) is bimodal, with seasonal maxima during the "long rains" of March–April–May (MAM) and the "short rains" of October–November–December (OND). Below average precipitation during consecutive long and short rains seasons over eastern Africa can have devastating long-term impacts on water availability and agriculture. Here, we examine the forcing of drought during consecutive long and short rains seasons over eastern Africa by Indo-Pacific sea surface temperatures (SSTs). The forcing of eastern Africa precipitation and circulation by SSTs is tested using ten ensemble simulations of a global weather forecast model forced by 1950–2010 observed global SSTs. Since the 1980s, Indo-Pacific SSTs have forced more frequent droughts spanning consecutive long and short rains seasons over eastern Africa. The increased frequency of dry conditions is linked to warming SSTs over the Indo-west Pacific and to a lesser degree to Pacific Decadal Variability. During MAM, long-term warming of tropical west Pacific SSTs from 1950–2010 has forced statistically significant precipitation reductions over eastern Africa. The warming west Pacific SSTs have forced changes in the regional lower tropospheric circulation by weakening the Somali Jet, which has reduced moisture and rainfall over the Horn of Africa. 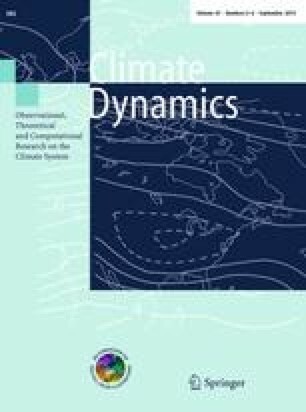 During OND, reductions in precipitation over recent decades are oftentimes overshadowed by strong year-to-year precipitation variability forced by the Indian Ocean Dipole and the El Niño–Southern Oscillation. The authors would like to thank two anonymous reviewers whose comments and suggestions helped to improve the manuscript. This research builds upon a multi-year research project carried out under a U.S. Agency for International Development-funded Famine Early Warnings System Network agreement with the U.S. Geological Survey.